Back in January, PalmSource announced a licensing agreement for CIC's Jot handwriting recognition software for the next generation of data input for the Palm OS. 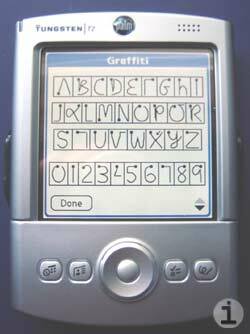 PalmSource has committed to Graffiti 2 as the next generation input method for the Palm OS. To the delight of many long time users, original Graffiti can be restored in a few simple steps. Resident Hong Kong Palm OS enthusiast, Brando, recently posted the basic instructions on his website. You will need access to a Palm Tungsten T or Sony Clie with Palm OS 5.0 to get the necessary files for the procedure. Palm OS 5.4 compatible files are listed below. Beam or copy the above 2 files to the target handheld you want to install original Graffiti on. Preform a soft reset (simply press the devices reset pin), and you're set to start enjoying original Graffiti again. PalmInfocenter tested this procedure with a Tungsten T and were able to successfully install Graffiti over Graffiti 2 on a Tungsten T2, Zire 71, Tungsten C and a Sony Clie NX80V. Other models that run Palm OS 5.0 should also be compatible. Even after the replacement the write anywhere on screen feature of Palm OS 5.2 still function as normal, even on the Tungsten C. The on-screen Graffiti reference also reverts back to the original guide. if for any reason you want to restore Graffiti 2, you must preform a hard reset. A Hard reset it preformed by holding the power button down during a reset. This will restore the handheld to it's original factory state, and will wipe out all of your installed programs and data, so make sure you have a recent backup on hand. Ben Combee sent in this tip that will allow you to revert back to Graffiti 2 without a hard reset. In Filez, go to the Details form for each database. Change both the name and creator code of each one. In Filez, delete the two databases, then soft reset. This howto does not work with the Sony Clie UX50. It does work with the T3. Files for Palm OS 5.4 devices including the Tungsten T5, TE 2, Z22 and Palm TX are available here. This tutorial is provided for informational purposes only, use at your own risk.